Here is a look at two prototypes of a new fencing line. 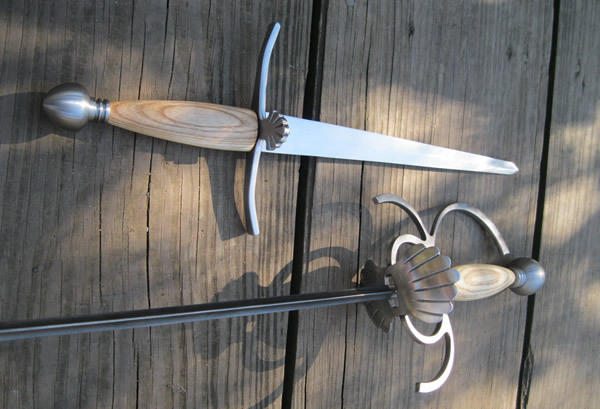 We have made fencing swords for awhile, but are going full tilt in this direction for 2012. We have a big batch of these in the works and they are ready to be ordered now with a delivery date of 7-10 days from the order. So far we have already made a few design changes to this set. their pommel will be swaped out for a scaled down version. The knucklebow has also been beefed up. This set is meant to be a entry level pair. We will of course continue making our full hilted rapiers, but wanted to be able to offer a simple set that still functions well and looks pretty good. Please feel free to inquire about special bulk order discounts as we are willing to make the prices better the more you buy. These come standard with epee blades but can be swaped out for a schalger blade for an additional fee. 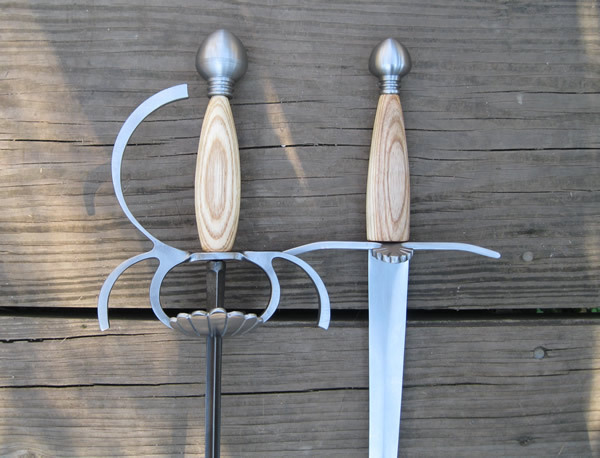 I should also say that the center section of the rapier can be swaped out for any of our styles. This one pictured is our "double down" center section. The standard wood is hickory with a light oil. Looks like they'd be great for stage combat!